Remove the stems from the mushrooms, discard. For the bacon and chilli filling: Using a hotplate, breakfast plate or fry pan cook the bacon and brown onion until the onion has caramelised. Once cooked, set aside to cool. In a bowl combine the chilli, sour cream and season with salt and pepper. Add the bacon and onion mixture, stir to combine. For the Tuscan filling: In a bowl combine the sour cream, garlic powder, rosemary, parsley, season with salt and pepper. Using a spoon fill the centre of each mushroom with the sour cream mixtures. 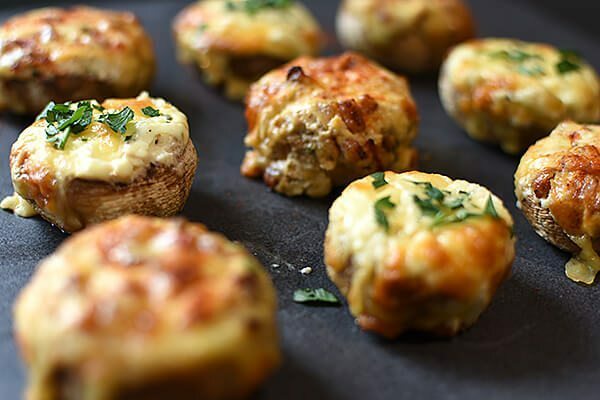 Top the stuffed mushrooms with a sprinkle of grated cheese. Once the barbecue has preheated turn the control knob to the roast setting (please refer to your handbook for further instructions). Place the mushrooms on top of the trivet/ cooking grills and cook for 10-15 minutes or until the cheese turns golden brown.